The Indian Air Force’s chief of air staff, Air Chief Marshal Birender Singh Dhanoa, arrived at Dhaka, on a 5-day-long visit. A report published on Sunday by Dhaka Tribune stated Air Chief Marshal Dhanoa, who has been accompanied by his wife Kamalpreet Dhanoa and a two-member delegation, arrived at the national capital of Bangladesh on Sunday evening. 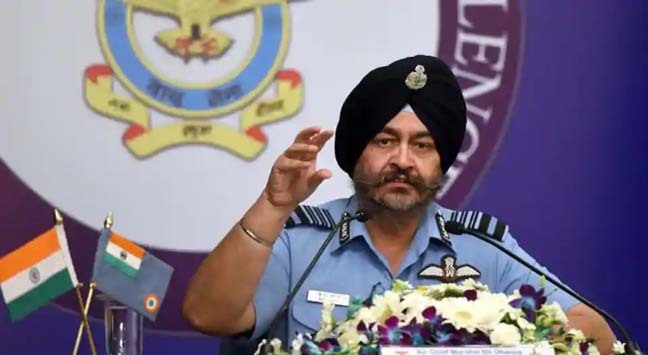 Air Chief Marshal Dhanoa is on Dhaka tour at the invitation of Bangladesh Air Force’s chief of air staff Air Chief Marshal Masihuzzaman Serniabat. The Indian Air Force chief will pay a courtesy call on Bangladesh Prime Minister Sheikh Hasina and have a meeting with the senior military leadership during his visit. “The Air chief will also be visiting major Bangladesh Air Force (BAF) air bases during the course of his visit,” the Indian High Commission in Dhaka said. “Visit of the Indian Air Force chief will further strengthen the close and fraternal ties existing between the Armed Forces of the two countries,” it added. According to the Defence Ministry, Air Chief Marshal Dhanoa’s official tour in Bangladesh will begin on Monday. the ministry added that his Bangladesh visit is a part of the bilateral goodwill visit to a SAARC (South Asian Association for Regional Cooperation) nation. The Indian Air Force chief is scheduled to visit the operational and training units of Bangladesh Air Force.